A retired bishop and a monk of Hanga abbey Very Reverend Placidus Gervas Nkalanga, OSB, died on the 18th of December, 2015. He was 97 years old. He came to Hanga abbey and became a monk after retiring as a bishop of Bukoba, in northwest Tanzania, 30 years ago. He was known for his simplicity and humility in the community. He spent most of his energy and time for the Formation House in Nakagugu where he established a big banana garden, the work for which he had great passion. He also built a beautiful church at the center. He will be greatly missed by Hanga community. May he rest in peace! 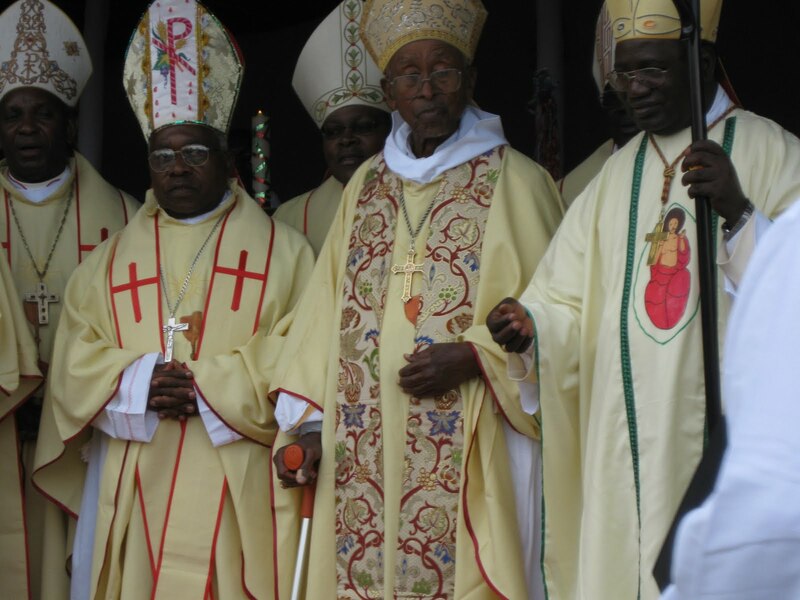 Bishop Placidus Nkalanga (middle) and Policarp Cardinal Pengo (with crozier) when bishop Nkalanga wa celebrating his 25th anniversary as a monk. Bishop Nkalanga in his banana garden at Nakagugu Formation House where he spent most of his time to tend the garden and the youths under formation. A photo of Bishop Placidus Nakalanga, OSB, taken in 2011 on day he celebrated 50 years as a bishop.